Uttar Pradesh chief minister Yogi Adityanath received the Prime Minister upon his arrival in Prayagraj. New Delhi: Prime Minister Narendra Modi on Sunday performed Ganga Arti and washed the feet of sanitation workers during his visit to Prayagraj to attend the Kumbh Mela. The Prime Minister, who took a dip in the Ganga, was taking part in the “Swachh Kumbh Swachh Aabhaar” award function, where he was acknowledged the efforts made by the ‘swachh karmacharis’ to keep the Kumbh grounds clean. He then shocked the awardees by turning towards them to wash their feet. 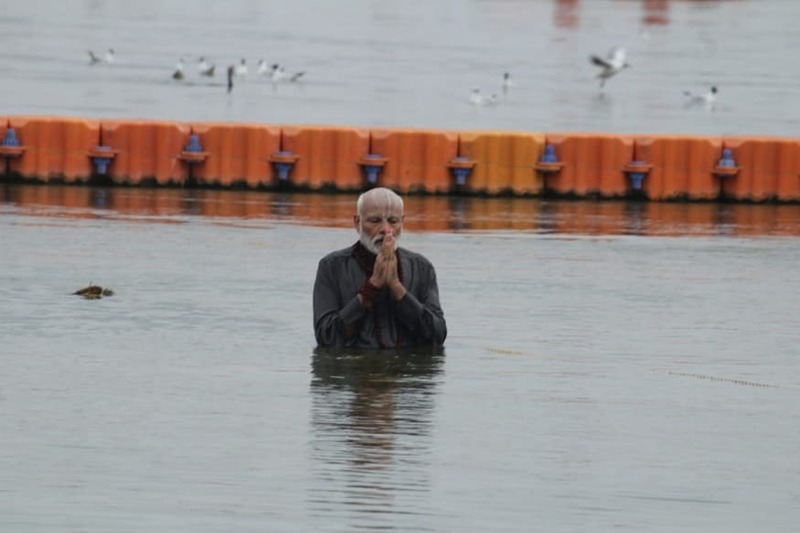 Prime Minister Narendra Modi taking a dip in the Ganga river. He added that the amount of money he received as part of the Seoul Piece Prize has already been dedicated to Namami Ganga Mission. “They work from dawn to dusk but don’t claim to credit or limelight for doing it. We hear about their commendable work back in Delhi,” PM Modi said. The Prime Minister then went on to say that a Swachh Sewa Samman Kosh has been constituted by his government in view of those who have tirelessly worked for the success of the global event (Kumbh). Uttar Pradesh chief minister Yogi Adityanath received the Prime Minister upon his arrival in the holy city. The Prime Minister also performed puja at the Sangam ghat. Dubbing Prayagraj as a great inspiration for the whole country in terms of cleanliness, Prime Minister Narendra Modi said that by the end of this year, India will declare itself free of open defecation. “The last time I came here, I had said that the next time I visit Kumbh, it will become a place of spirituality, faith and modernity. I am glad that all of you have turned this into reality,” Modi said. Further, while praising the police and the security arrangements at Kumbh, PM Modi said that the ‘Lost and Found’ Department has done remarkable job to maintain the security and reuniting families. Earlier in the day, Modi formally kicked off the implementation of Rs 75,000-crore Pradhan Mantri Kisan Samman Nidhi (PM-KISAN) scheme and distributed the first installment of Rs 2,000 to over one crore farmers during his visit to Gorakhpur and Prayagraj. This entry was posted in Kumbh and tagged 2019 Kumbh Mela, Gorakhpur, Prayagraj, prime minister narendra modi.